Much of Ebix's business comes from EbixCash, its Indian subsidiary which generates most of its revenue through software platforms combined with third-party kiosks. This 'phygital' strategy is smart and reproducible on different segments, markets and even geographies. 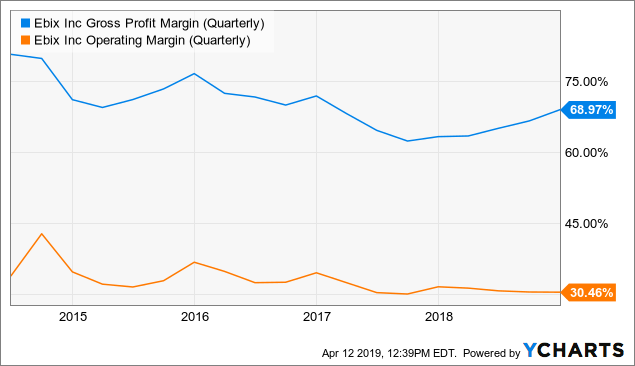 The company produces 30% operating margins and considerable free cash flow, even pays a dividend and has a declining share count despite numerous acquisitions. The shares are actually quite cheap, but there is a 30% short position in the company's shares, which we struggle to explain. The company is planning an IPO of EbixCash, which could well provide a considerable boost to the share price. 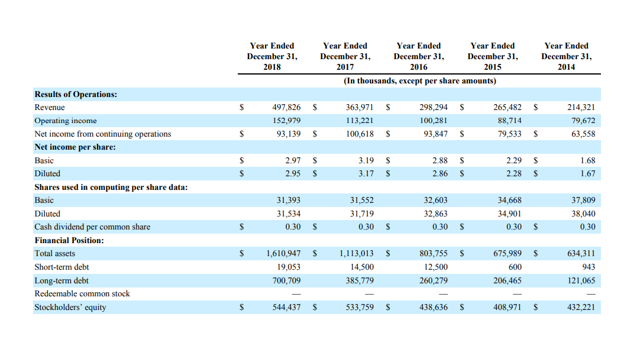 While they are off the lows of December (the whole market is and Ebix was further helped by a well-timed $100K share purchase at the open market from its CEO on December 21 at $39.71), they are well off their highs earlier in 2018 whilst the company is actually growing revenues at 30%+. Add to that the host of acquisition, buybacks and dividends and the fact that the company has an operational margin of 30%, is cash-flow positive and has IPO plans for its sprawling Indian business EbixCash, and we think the shares could be a winner here. However, we have to point out that others apparently don't think so, a whopping 30% of the float is sold short. Ebix is a leading international supplier of on-demand infrastructure exchanges to the insurance, financial, and healthcare industries. In the Insurance sector, the Company’s main focus is to develop and deploy a wide variety of insurance and reinsurance exchanges on an on-demand basis, while also, providing Software-as-a-Service ("SaaS") enterprise solutions in the area of Customer Relationship management ("CRM"), front-end & back-end systems, outsourced administrative and risk compliance. The Company's products feature fully customizable and scalable on-demand software designed to streamline the way insurance professionals manage distribution, marketing, sales, customer service, and accounting activities. This channel forms the primary focus of the Company across the world. Ebix operates data exchanges in the areas of finance, travel, life insurance, annuities, employee health benefits, risk management, workers compensation, insurance underwriting, and P&C insurance. Each of these exchanges connects multiple entities within the financial and insurance markets enabling the participant to seamlessly and efficiently carry and process data from one end to another. Ebix’s life, annuity, and employee health benefit exchanges currently operate primarily in the United States. The P&C exchanges operate primarily in Australia, New Zealand, and the United Kingdom. Ebix financial and travel exchanges currently operate primarily in India, the Middle East and certain ASEAN countries. Exchange revenue is derived from two main sources, namely subscription fees 6 Table of Contents associated with accessing the exchange and transaction fees charged for each transaction processed on an Ebix Exchange. These exchanges have been designed to completely adhere to industry and regulatory data standards. That's a pretty healthy picture with revenues more than doubling in five years and solid operational progress. The dip you see in the last quarter of net income is due to the impact of a one-time tax $24.5M charge related to the implementation of the 2017 Tax Cuts and Jobs Act transition tax. The company is using the operational success to expand heavily in Asia, most notably India, via acquisitions with its Ebix2.0 strategy. Much of the company's business (like its travel and cash businesses) operates on a "phygital" strategy combining physical distribution outlets to an omni-channel online digital platform. It can then use the same platform and retail outlets for introducing new businesses, which we think is a really smart strategy. We might have missed a few, it's hard to keep up (but they are listed in the 10-K). Let me discuss what we’re trying to do in India. We’re trying to build a – we are trying to build an India-based knowledge center for financial services, travel distribution and travel technology, insurance distribution and e-learning that can then be deployed across the world. We’ve branded the entire India based global operation as EbixCash to encapsulate that effort of ours. India-led revenues accounted for approximately $85.5 million in Q4 2018, translating to an annualized run rate of $362 million... International revenues in Q4 2018 accounted for 64%, while India-led revenues accounted for 51% of the Ebix revenues in the quarter.. It should be clear that while EbixCash is an Indian business, it also earns business from a host of other countries (mostly in the Middle East and Asia). Retail finance, offering inward and outward remittance and forex operations, gift cards, utilities payments, etc. Travel, consisting of two brands, Via (retail and SME) and Mercury (luxury) brands. The company is planning to engage in an IPO for EbixCash, which could be quite an interesting proposition, given its rapid expansion in fields which are likely to be only in the early innings of their development, given India's digltal potential. As an intermediate step, the company might sell a small stake (5-10%) to a private equity party in order to get a valuation benchmark. The company's EbixCash Financial exchange portfolio contains businesses in domestic & international money remittance, foreign exchange, travel, pre-paid & gift cards, utility payments, etc., in emerging countries such as India. We see tremendous opportunities for all these services in key markets like Singapore, Australia, Philippines, Indonesia, GCC Countries, London, Brazil, Thailand and of course the U.S.
With a "Phygital” strategy that combines 320,000 physical distribution outlets in many Associations of Southeast Asian Nations (“ASEAN”) countries, to an Omni-channel online digital platform, the Company’s EbixCash Financial exchange portfolio encompasses leadership in areas of domestic & international money remittance, foreign exchange (Forex), travel, pre-paid & gift cards, utility payments, software solutions for lending and wealth management etc. in India and other markets. EbixCash’s Forex operations have emerged as a leader in India’s airport Foreign Exchange business with operations in 32 international airports including Delhi, Mumbai, Bangalore, Hyderabad, Chennai and Kolkata, conducting over $4.8 billion in gross transaction value per year. EbixCash’s inward remittance business in India conducts approximately $5 billion gross annual remittance business, confirming its undisputed leadership position in India. EbixCash, through its travel portfolio of Via and Mercury, is also one of Southeast Asia’s leading travel exchanges with over 2,200+ employees, 212,450+ agent network, 25 branches and over 9,800 corporate clients; processing an estimated $2.5 billion in gross merchandise value per year. We recently created a new EbixCash Financial Technology division under the leadership of a Managing Director that focuses on enterprise technology, back-end and exchange needs of clients in the area of lending, assets and wealth management and stock trading. In fourth quarter, all these businesses grew sequentially as compared to Q3 of 2018. Our clientele in this area includes leading banks and financial institutions in Europe, Asia, Middle East, Africa and India with approximately 50% of the business coming from India. combining EbixCash’s 320,000 plus phygital outlets across the country, with BSE’s strong network. While the technology and functionality is ready, we await approval on our license application from the insurance regulatory body. We expect the regulatory license anytime now and believe that this is one of the biggest opportunities that we are pursuing. We are endeavoring to do something that has never been done earlier in any part of the world. Traditionally across the world, insurance is only sold by insurance agents, brokers or directly by carrier salespeople, who have to be licensed agents. We want to do something completely different. We’re trying to sell insurance in every nook and corner of India, through distribution outlets, that for example could be a grocery shop, or a mobile phone outlet, or a financial outlet, travel outlet. BSE's network of 300K terminals and financial brokers and institutions and EbixCash 320K distribution outlets. Insurance platform software is the company's core business. And this is by no means all, we can name stuff like a new enterprise contract for video insurance in Philippines, a deal with India's largest bank to implement "our lending enterprise solution that encompasses all its aspects of lending." The addition of stock-broking technology solutions to this division, the Smart-Class e-learning venture, trucking logistics (EbixCash Routier) etc. It's all a bit dizzying. Management sees this as the fastest growing area of the company. The company is the fifth player in the Indian market in terms of GMV (roughly $2.5B) and already the second player in the B2B market. It has 2,200+ employees, and an agent network in excess of 212,450, 25 branches and 9,800+ corporate clients. The B2B market tends to be more profitable compared to the B2C market where players subsidize customers and therefore incur losses. and allow various international travel aggregators to sell the platform to their corporate clients and in continents like the United States and Europe. To cement its position in the B2B market it has proposed an acquisition of the number one company in that sector, Yatra (YTRA). Yatra is also the second-biggest player in the B2C market, behind MakeMyTrip (MMYT). Yatra is profitable in its B2B business, but not in its B2C business where it subsidizes hotel bookings. Overall it's not profitable, so potentially this runs the danger of compromising Ebix's 30%+ operating margin policy. we want to reach the B2C market through the B2B market. What we want to do is we want to sell into the consumer through retailers, through our phygital outlets. An agent network in excess of 212,450, 25 branches and 9,800 plus corporate clients. A digital platform (from Via, combined with the backbone from Zillious, see the article from SA contributor Donovan Jones) to convert the phygital outlet into a digital outlet. wherein a consumer can walk in, and that business can happen or if the consumer wants to do that business over a mobile phone or through any other means whether they’re traveling in a bus and they want to book their next bus ticket or their next train ticket or their next airline ticket, we want to facilitate all of that and we are trying to do that through the corporate channel, through the retail outlet and also the B2C, but without subsidizing the consumer... One, we have the retail technology available, which is deployable internationally and today works internationally, that’s a Via’s technology. The second thing we have – we have the backbone of travel which is Zillious. Zillious is today being used by the who’s-who of the travel market in India, our competitors tend to use it and today we own Zillious, which means we have an edge in terms of – if we wanted tomorrow to provide a self-booking tool to a large corporate, we have that ability. Management claims its travel business is profitable, contrary to that of the competition. It remains to be seen how it will turn Yatra's business profitable, simply ending its B2C subsidies might cut it but we're not convinced this can be done without a hit to its (B2C) business. In the end, no matter how smart the software platform and/or how many outlets you have, if these don't confer a significant price advantage, there will be others undercutting you. The company did beat expectations for Q4 both on a (non-GAAP) EPS basis at $1.06 (11 cents above expectations) and revenue of $140.7M, a substantial $10.27M above expectations. 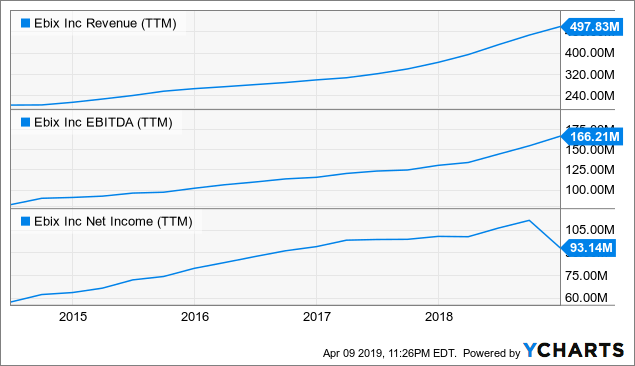 I’d like to set up an aspirational annualized revenue run rate goal of $750 million by the fourth quarter of 2019, implying $187.5 million in quarterly revenue that quarter. I would like to get to that aspirational goal while having 30% or more in operating income. This guidance is up by $100M and also includes a 34% EBITDA margin goal. The company has managed to hold on to its 30% operating margin target even on a GAAP basis, which considering the amount of acquisitions it has engaged in is quite remarkable. As we scale our business up over the next six months, we expect our operating margins to grow by a few points. 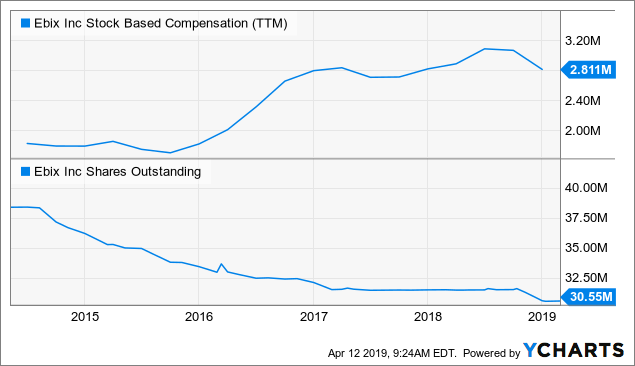 With 30%+ operating margins, there is not a whole lot you can do wrong with the company, even if it has substantial debt ($700M). 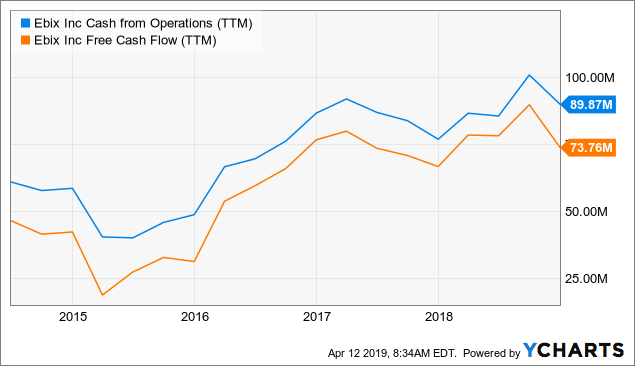 What's more, the company is in perennial acquisition mode, so its (GAAP) numbers and cash flow are continuously expressing costs which would dry up once it stops acquiring other companies. if we buy Weizmann or we buy Essel Forex, or we buy Lawson Travel or we buy Pearl. There’s an immediate requirement for us, now to come up with the cash to fund the business, to buy the inventory from the foreign exchange, we’re holding at any point of time to give you a number, at any point of time in a pre-Weizmann exchange, foreign exchange model, we were holding cash results – cash of somewhere around $15 million, just in cash, currency at any point of time, you add to that all the airport money that you’re going to handle, all the corporates you’re funding, because corporates will have a delay in paying you for foreign exchange, for travel, you’re going to pay that money in advance to the airlines. During Q4 2018, we invested a total of $2.2 million on dividend payments, $4.5 million on CapEx, $3.8 million on principal payments towards the term loan and 581 [Audio Dip] on tax payments. We funded these initiative from existing cash plus operating cash flow in the quarter, while drawing $76.1 million from our bank credit facilities to fund the closing of six of our acquisitions in Q4. It also listed a host of things the company pre-finances with its cash flow in a separate PR. 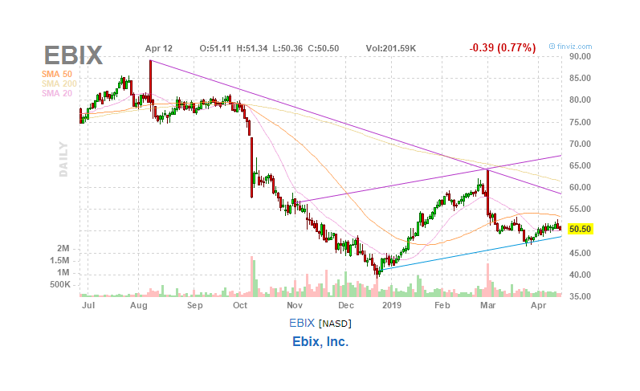 Ebix repurchased 966,773 shares of its common stock for an aggregate amount of $47.4 million in Q4 2018, and 996,773 shares of its common stock for an aggregate amount of $49.6 million in the full year 2018. Included in these figures was the repurchase of 200,000 shares for a total of $8.8 million that were not settled until January 2019. Valuation is really quite moderate. The 17x earnings multiple is on a GAAP basis containing significant amount of one-off cost related to acquisitions and also this year a substantial one-off tax bill. Analysts, on average, expect 2019 EPS to come in at $4.43 this year on a non-GAAP basis (and $5.49 in 2020), which would make the shares really cheap. Then there is the possibility of something of a bonanza of the EbixCash IPO. Quite frankly, we have scratched only the surface of the company here, it has so many moving parts that this should only be considered an introductory article. The company has dozens of businesses and a comprehensive view would consider all of these in much greater detail. The debt is one obvious risk, but the cash flow and margins the company generates is really sufficient for us not to be worried. Should economic circumstances deteriorate, the company has lots of buffers, like its dividend, share buybacks, continuous acquisitions, which could all be slowed down should the debt level warrant that. Another thing to point out is that the market is 30% short, which is an unusually large number and we are at a loss to explain it. The obvious explanation, the weakness in its internal control systems has been remedied, per its auditors and a "renowned third-party US-based firm that specializes in accounting investigations and compliance." However, the short count hasn't come down as a result. We're not entirely convinced management will be able to turn around Yatra after the likely acquisition (and that one is likely to add to the debt as well, as Yatra's market cap is a little above $200M), but management seems confident and the loss (less than $10M) isn't all that large. SA contributor Donovan Jones mentioned the risk attached to its peer-to-peer lending business, but how big a part is that? There was nothing on that in its 10-K. The 'phygital' strategy, combining platform software with networks of third-party retail outlets, and the way this can be deployed into multiple markets, segments and geographies. The blueprint for expansion to other countries. The fact that 80% of its revenues comes from exchanges and once dominant, are hard to unseat. The lean operating model, generating 30% operating margins. 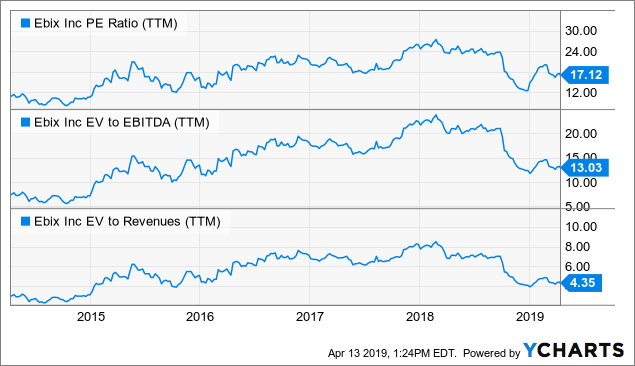 The way they maintain 30% operating margins, significant free cash flow, dividends and share buybacks (leading to a substantial decline in the share count) despite a flurry of acquisitions and related cost. Against that one can argue that the company has a really substantial debt, although not one that they can't handle. The curiosity in this picture is the 30% short count, which has been rising steadily. The shares are cheap, with the possibility of the EbixCash IPO, in which the company is likely to remain as majority holder, a possible catalyst for the share price. 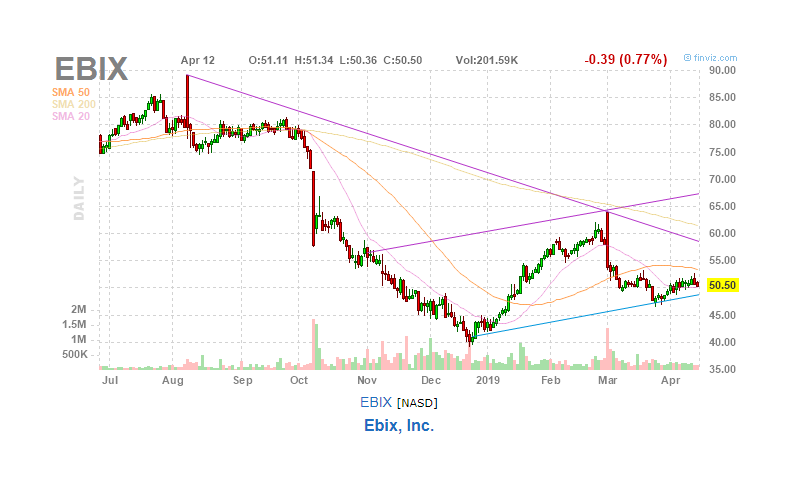 Disclosure: I/we have no positions in any stocks mentioned, but may initiate a long position in EBIX over the next 72 hours. I wrote this article myself, and it expresses my own opinions. I am not receiving compensation for it (other than from Seeking Alpha). I have no business relationship with any company whose stock is mentioned in this article.